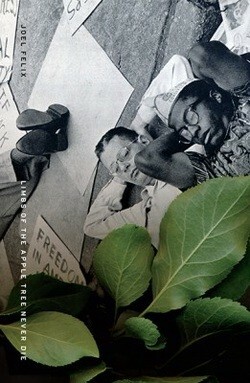 Joel Felix, Limbs of the Apple Tree Never Die (Verge Books, 2013), 90 pp. $15.00—Imagine that Russell Atkins had a child with Charles Olson, midwifed by Laura Riding. That might be Joel Felix. His first book is a moving meditation on the impossibility and necessity of poetry, on history as “enslavement without end,” and the possibility, however unlikely, that there remains, its brutalities notwithstanding, a truth-telling residue in language. The occasions for Felix’s thoughts are the civil wars that engulfed late classical Rome and the “late” Civil Rights Movement (1950s-1960s) that almost tore apart the United States. The allegorical link between these struggles over the civic, itself an epiphenomenon of the social, economic and political spheres, is the peculiar, if not altogether unique, history and properties of the apple. Just as the Romans grafted “choice fruit” to “unproductive trees,” Felix, working with an Olson-Atkins concept of field poetics, grafts “fleeting fantasies of liberty” and “constituencies of democratic violences” to “the languages of everyday performances, uncontained but conditioned by geography.” However, just as each generation of apples “forgets its former juices,” confounding horticulture, so too history is, here, a kind of inevitable, albeit necessary, “forgetting.” The bulk of the above is gleaned and lifted from the “Afterword,” but the contexts it provides are hardly necessary to grasp and appreciate the crippled lyricism, the damaged insights of these poems, prose narratives and what Felix calls “field notes.” The latter marks his travels from Chicago to the Civil Rights Museum in Montgomery by way of Cairo, Illinois; the intrinsic fantasy of Huckleberry Finn’s and Jim's escapades pn the Mississippi serve as prelude to, and matrix for, Bull Connor and the deaths of four black girls in a church basement. That is, literature does not get a "pass' in terms of how it serves larger cultural, political and social forms of control and management. Thus, glossing Blanchot and Agamben (though neither appears as such in the book), Felix recovers history as “horror,” foundation and first step for a kind of moral and aesthetic courage to face ideology per se. The actual poems included here will remind readers of both Emily Dickinson (“if I fear,/the fear in my open mouth,/vomits Him.”) and Ronald Johnson (“’Holly’/’Holly’/behind you// I chew my/dew claw”), but the recent musings of Rob Halpern are not far from poems like “Matthew Brady Poses The Dead” and “Seps Carnivale”: “now up to the knees in/our ordinary occupations of the soldier/on Aff-/ric march.” The apple poems—Spitzenburg, Baldwin, Roxbury Russet, etc.—are interspersed among more explicitly “political” poems—like those listed above—but, truth to tell, all the poems resonate with social commentary, emphasizing that the migration of the apple across continents and though world history traces the march of war and violence and the possibility, however fleeting, that what is torn asunder may be reconciled. Thus “Spitzenburg (Apple)”: “The soil thumps like a belly/up the Hudson.// Follow the sound Sojourner;/ avoid fracturing/fugitive joy—…“ But the cost of reconciliation cannot be overestimated. As Felix becomes increasingly self-conscious of his white skin the closer he gets to the Civil War Museum, he reminds himself that becoming “less white” is often less a matter of ethical choices (and thus a kind if privilege) than panicky reactions to collapsing safety nets. Thus Felix appropriates a chat from the Stormfront website; the writer is a soon-to-be-single white woman with two children under the age of two, struggling to pay her bills: “I’m afraid that tomorrow that I’m going to the local welfare office to apply for food stamps and maybe a check to tide us over until I find a job. Does this make less [sic] a WN if I get food stamps or a check? I just feel less white just thinking about it.” For Felix, the distance between his “whiteness” and that of this anonymous writer is a matter of degrees, not kind. However, one may interpret this “fall” otherwise, as Felix does: less a plunge into shame than an abdication of unearned privilege, a stepping down, however enforced, from the throne. In doing so, one enters the unexplored terrain of the actual. As British novelist Julian Barnes puts it, one abandons the consolations of myth for the uncertainties of reality. In Felix's terms, one moves from “Less White” to “Least Wind” where “era is ova,” the very image of the projective (e.g., the Riemann sphere that has served as the "trademark" of this column all summer) and possiblity, however chained to the past and present.